There are seemingly few cliques within the UConn football team. The team’s 2018 motto “Rise as One” is evident in the camaraderie that can be seen across the board on the Huskies. Still, position groups spend a lot of time together and bonds often form between the players in those meeting rooms and huddles. To that end, the Huskies’ running backs make up perhaps the tightest knit group on the team this season. And they remain that way despite their dwindling numbers. When junior running back Donevin O’Reilly suffered a knee injury in practice two weeks ago that ended his season before it even officially began, sophomore running back Kevin Mensah provided a shoulder for O’Reilly to cry on. “That’s my brother. I felt that,” Mensah would say later. A week earlier, when sophomore running back Nate Hopkins told his teammates that he would be leaving the program as a transfer, it was redshirt freshman Zavier Scott who was there to wish him well. And now that the Huskies’ corps of backs is down to just Mensah and Scott, there is still a strong bond. “I love that guy. He’s one of my closest friends on the team,” Scott said. True freshmen Khyon Gillespie and Dante Black are also available, and given the NCAA’s new redshirt rule are likely to be given some carries here and there this season, but the Huskies’ running back contingent this season for the most part consists of Mensah and Scott. And it’s pretty clear there’s a 1 and a 1A starter. Scott will begin the season as the starter but Mensah is for all intents and purposes the incumbent and likely will start his share of games in 2018. “You have to play two running backs at this level,” UConn coach Randy Edsall said. 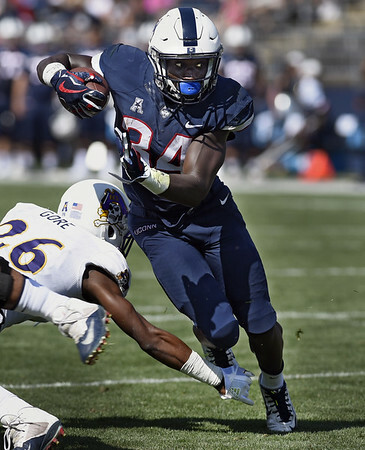 In the penultimate season of his first tenure at UConn Edsall used the two-back attack to near perfection, with Jordan Todman and Andre Dixon helping the Huskies to wins over the likes of Notre Dame and South Carolina on their way to an 8-win season. Mensah may be coming off the bench to start Week 1 for the Huskies but it’s not because of a lack of ability or performance. The team’s leading returning rusher - he ran for 561 yards as a true freshman last season - Mensah was suspended for the bulk of spring practice for academic reasons. When he was allowed to return to practice, Mensah was apologetic, re-focused and perhaps a bit humbled. Edsall has since praised his rededication to the program. UConn running backs coach erry Richardson said Mensah earned an important life lesson about priorities and dedication. “It’s going to help him mature as a person,” Richardson said. Still, Mensah began training camp near the bottom of the depth chart. In part because of the losses of Hopkins and O’Reilly, and in part because of Mensah’s continued outstanding attitude and effort, Mensah is back with the first team. And Mensah himself believes he’s improved on the field this August. “I think I’ve been better. I’ve been patient, had better vision, discipline,” Mensah said. For Scott, a converted wide receiver who went to high school in Germany, his first taste of game action with the Huskies will likely come with a great deal of nerves. But Edsall and Richardson have seen things in Scott that remind them of talented Huskies of old like Todman and Dixon. “He reminds me of some of those guys we had here before as running backs in terms of what we think he’s capable of doing,” Edsall said. Edsall says Scott is an every-down back who has the ability to run, pass block and catch the ball out of the backfield. And his attitude is apparently top-notch as well. Posted in New Britain Herald, UConn on Wednesday, 29 August 2018 19:02. Updated: Wednesday, 29 August 2018 21:24.